- 2 Attached Gunwale Seats FREE Upgrade at No Extra Charge! The Sportspal by Meyers is manufactured from Aircraft Grade Aluminum, which is then stretch-formed, heat treated and hardened. The two piece hull is then joined at the keel. This makes the Sportspal by Meyers very durable. 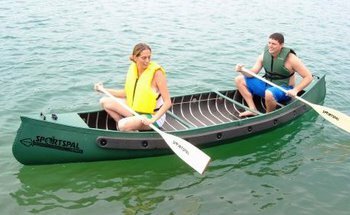 The Sportspal by Meyers, Made in the USA, should not be confused with another canoe manufactured in Canada, whose hull is composed of thinner (0.022), softer (marine grade) aluminum. The Sponsons and Liner on the Sportspal by Meyers are also larger and thicker than the Canadian model. Molnar Outdoor, Inc. is an authorized Sportspal dealer! Canoe returns must require return authorization from Molnar Outdoor. All Canoes returned must be new, unused, and in its original box. Unauthorized returns will be refused and become responsibility of the returnee. All shipping and handling costs are absolutely non-refundable and all return shipping costs are the responsibility of the returnee and must be prepaid. A 20% re-stocking fee applys on all returns. Note claims for shipping damage must be submitted through the freight carrier and not through Molnar Outdoor. It is highly reccomended that you inspect your canoe for damage before signing the freight carriers release form. Orders cancelled after the canoe has been shipped will be charged for all shipping costs incurred. Returns will not be accepted after 30 days from the date of delivery. Note: All warranty claims must be filed by the individual directly through Meyers Boat Co. in Adrian, MI., not through Molnar Outdoor in Elyria, Oh. Where can I find the serial number on my Sportspal canoe? The serial number is found at the rear of the boat. It is on the right side and can be found on the lip. Please note, however, that canoes older than 1973 may not have a serial number as it was not required at that time. How can I register my canoe if it does not have a serial number? You must go to a branch of the state agency from which you must obtain the registration and they will provide you with a serial number in order to assist you with registering your canoe. How can I tell how old my canoe is? If your canoe is newer than a 1973 it is possible to determine the age of the boat from the serial number. The last two digits of the production year will usually be the last two digits of the serial number. What kind of paint should I use on the outside of my Sportspal canoe? An automotive or industrial paint supply store can assist you in the selection of an appropriate paint if you choose to paint the exterior of your canoe. Where can I buy parts for my Sportspal canoe? You may order parts online through this website or by calling (440) 986-3366. How long should the foam on my Sportspal canoe last? If it is well cared for, kept out of sunlight when not in use, and there is no chemical contact sponsons should last approximately seven years and the liner should last approximately fourteen to fifteen years, but keep in mind that this may vary. What do I do if the ribs come loose in my canoe? If the ribs in a Sportspal come loose a mallet can be used to retighten them if it is possible. If the foam has started to deteriorate, this most likely will not work since the ribs are held in place by the liner. It is possible to slide out the rib, put an additional piece of foam behind it, and put the rib back in place for a tighter fits. If all else fails, it may be necessary to replace the entire liner in order for the ribs to have the proper fit. Never remove the ribs without replacing them as they are necessary to maintain the structural integrity of the canoe. What kind of oars should I use with my Sportpal canoe? Sportspal canoes come with paddles, not oars. We also sell paddlelocks that mount to the paddles and convert them to oars for use with the larger canoes (this is not recommended for the S-11 or S-12 canoes). We recommend using masking or foam tape where the paddlelocks will be clamped on and connected with a wingnut and carriage bolt to the paddlelock sockets already on the canoe. An ethafoam seat or a center gunwale seat installed in paddling position is required in order to row. Can I tip a Sportspal canoe over? Yes. While it is harder to tip than a regular canoe, it is possible. The same precautions should be taken with a Sportspal canoe as with any other canoe. Also note that the longer canoes are more stable than the shorter models. What are the holes at the end of the canoe for? The holes are meant to be used for drainage. When you are done using the canoe, tip it over and any water in the liner will drain out. Can I use my Sportspal canoe in salt water? If you are going to use your canoe in salt water and let us know in advance of your purchase, we will paint under the liner as an extra precautionary measure, but you can use a standard Sportspal in salt water, as well, as long as the canoe is thoroughly rinsed with fresh water after use in salt water. I bought the mustard twelve foot sports pal canoe at the beginning of the summer from Meyers Boat Company. The order was not processed for two weeks after I called it in. I called to ask about it after about two weeks and then it was placed into the shipping process. It shipped fine and with no damage. I bought the smallest canoe to be able to handle it by myself. The photos were a misrepresentation of the truth. In fact it is difficult to manipulate the canoe and pick it up because of the width of the middle of the boat. I found two rivets missing from the front of the boat, the carrying handles are made of plastic and most disturbing is the ribs inside the boat are coming out of place under my feet. On the other hand it is easy to drag the boat out of the water, it cuts through the water like a dream and is not subject to being blown around as other canoes are. I love the design and there is plenty of room in the twelve footer for two average sized people. It is extremely stable. I speculated the company might of sent me a reject in effort to fill and over looked order, but I am not sure of that.